On the edge of the South West Wilderness, 1.6 million hectares of World Heritage Listed forest, lies one of the most visited tourist attractions in Tasmania. The Airwalk offers incredible views of the canopy, thrilling river crossings aboard swinging bridges and you can soar above the trees on the Cable Eagle hang Glider. Whether you’re looking for a quiet yet stunning walk through the magnificent roest, or an adventure challenge. One of Tahune’s three walking trails will prove to provide the perfect challenge. You get to explore paths that lead past beautiful and rare Huon Pines – a short easy track that gives insight into the wilderness of hardwood and eucalypt which locks up half of Tasmania. 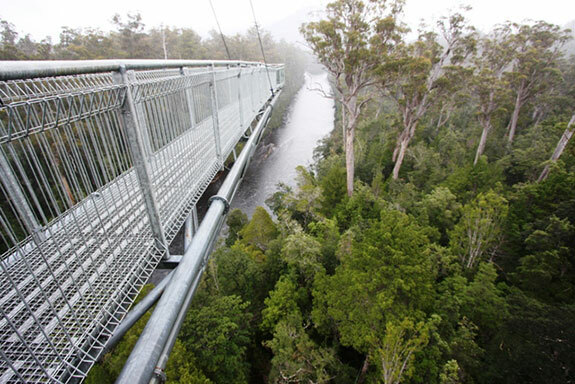 The highlight of the 500 metre long airwalk walkway suspended through the canopy is the cantilever, 48 metres above the ground with an incredible and dramatic view of the forested mountains, providing a backdrop to the Huon and Picton rivers which flow together in the basin below. The Airwalk is uphill and includes 112 gradual steps – there are handrails the whole way up and there is disabled access at the start for those who need it. The Cable Eagle Hang Glider is a 250 metre cable glide out over the Huon River – you reach a height of 50 metres and speeds of up to 40 kmph. There’s a cafe for lunch and you can even stay the night in a forest lodge or cabin.